Happy (belated) Mother’s Day, everybody! Here’s a film with a mask-covered mother terrorising her psychotic children, and maybe even vice versa! Such is the core of Goodnight Mommy, an Austrian horror film that gained traction last year with a trailer that suddenly went viral, with several media outlets reporting on the twisted nature of that promo and wondering what the rest of the film had in store for audiences. It was even put forward as a potential representative for the country in the Best Foreign Language Film category at this year’s Oscars, which of course didn’t end up happening (incidentally, be sure to look out for a review of the eventual winner, Hungary’s Son of Saul, later this month) but when you see the general response – 85% on Rotten Tomatoes, with a 65% audience score – you can’t blame them for the attempt. It is also proof that, as with a good chunk of the horror films we’ve been receiving over the past couple of years, horror films are finally starting to get more of a traction with the general movie-loving crowd, with even awards contention being a possibility (albeit dashed possibilities), and Goodnight Mommy is certainly up there with the strongest in terms of its scares and its own perceptions of horror as a concept – but perhaps just barely lacks the substance to make it a true stand-out. It has a very basic set-up – twin boys Elias and Lukas (played by real-life twins Elias and Lukas Schwarz) welcome home their mother (Susanne Wuest) after she undergoes cosmetic surgery on her face, leaving it in bandages and making her near-unrecognisable to the boys; but then, when she appears to be doing things that the boys consider to be out of character, such as forcing them to not be inside the house when they’re playing so she can rest, and even physically assaulting them, they become convinced that she is actually an imposter, and do whatever it takes to make her admit the “truth”. The use of quotation marks just now is no accident; the film makes no secret of the fact that there is more to it all than just the basics, and it does an effective job at establishing early on that there is something not quite right about either side of the argument. This all leads to what we think is meant to be a twist of sorts – don’t worry, spoiler-phobes; it won’t be ruined for you here – but with that being said, we’re not sure it was ever meant to be a twist in the first place. After all, it is signposted very early into the film, maybe not even ten minutes in, and there are a few unsubtle hints to it all throughout that even the most ignorant of viewers can pick up on; you’re left wondering if it was the intent of the filmmakers to not have it be such a secret at all, except only in its promotional material, which even then strongly suggests that something is not right with the seemingly black-and-white situation. Basically, if you act at all shocked when it finally does reveal its “twist”, maybe you just weren’t paying enough attention to it as you should have been. By all accounts, you should be paying attention to this film, because it’s still a very well-made movie whichever way you look at it. Like It Follows, it takes a very artistic approach to setting up its atmosphere, building towards its scares –this is a jump-scare-free zone, thankfully – and displaying some hauntingly beautiful cinematography, this one gaining the advantage of having the mostly sun-drenched Austrian countryside be its backdrop. You can easily identify the arthouse inspirations behind certain shots and moods, particularly Michael Haneke’s Funny Games (which, again without going into too many spoilers, you could position this as a pretty chilling prequel to), making it even more of an impressively executed film regardless of its genre. Be prepared though; despite the high production values and somewhat predictable final conclusion, this is a film that is not for the squeamish. 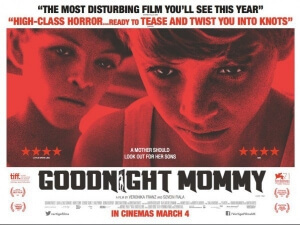 The things that this film gets into, particularly in its second half, has the potential to be the stuff of nightmares should you not have the stomach for it, and it is pretty disturbing stuff even if you do; and by not going into too many details about that as well, we’re all but safeguarding the suspenseful moments of horror that Goodnight Mommy has managed to mostly keep under wraps. Oh, and there’s cockroaches. Lots and lots of cockroaches. Happy Mother’s Day, everybody! Goodnight Mommy is a chilling and disturbing, though not entirely unpredictable, slice of Austrian horror that just about earns a place alongside The Babadook and It Follows as prime examples of horror movies that are actually worth watching, based off of its sheer terror and gorgeous production values alone.